Transport Canada is one of several partners involved in the project, with the others including the likes of the U.S. Department of Homeland Security, Dutch Ministry of Security and Justice, INTERPOL, Google, Visa and Hilton Worldwide. The system aims to empower airport authorities to focus more of their time and energies on scrutinizing high-risk travellers, according to a WEF report on the initiative. Currently, when a traveller arrives at an international border, they have to quickly and accurately be screened for permission to enter the country, with border officials required to determine their residency or visa status and assess risk factors in a short period of time. This ID is a BIG GOAL of the Satanists, and a CRITICAL STEP towards the imposed slavery in the coming police state. 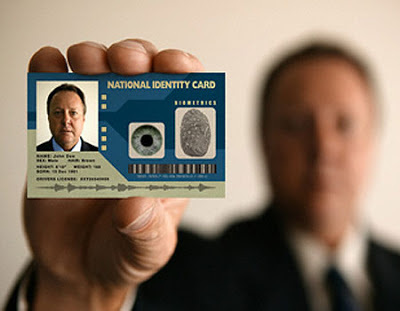 This diabolical ID card has been in the works for a long time, and is another federal edict that will make Big Brother even bigger as we march with large strides toward totalitarianism. There's a 99.99% assurance that this National Biometric ID will become a mandatory reality sooner or later. We must recognize this as a HUGE and CRITICAL component of the apparatus of the coming communist dictatorship that will ensure centralized control over absolutely everyone. Please note that the bill's sponsor -- Rep. Rob Goodlatte --is allegedly "pro-life." But this bill highlights the catastrophic reality that even politicians who vote "pro-life" cannot be trusted. Catholic Rep. Chris Smith on NJ (who is always featured on EWTN) is another example. He voted in favor of a "cap and trade" bill (= communism) some years back while being otherwise "pro-life." The alleged "pro-life" stances of Reps Goodlatte and C. Smith are thus very shallow and/or ultimately FRAUDULENT (and probably bought and paid for) -- as BOTH of these men are pushing the US into a totalitarian political system, where ALL human life will be dominated and DISPOSABLE on every level. And more specifically, all modern totalitarian systems have "legalized" abortion... And even the "pro-life" politicians are furthering the coming global police totalitarian/communist state.